We first made this for a potluck we attended a while back Katie came up with the things she would like to have in a pasta salad, and we worked up the recipe together. She also helped put it all together. We recently made it again for another potluck, and I realized that I never shared her recipe. It’s simple and quick to make, but sure tastes good! Mix all ingredients well in a large bowl. Cover and chill in the refrigerator for at least 30 minutes before serving. This is a recipe that my mom gave me after my older daughter was born. Knowing I would have my hands full, she gave me a bunch of recipes that would be quick and easy to make. I used to make this more, but just haven’t made it for a while. I’ve been getting back to using a few recipes, and was surprised I hadn’t shared this one yet. 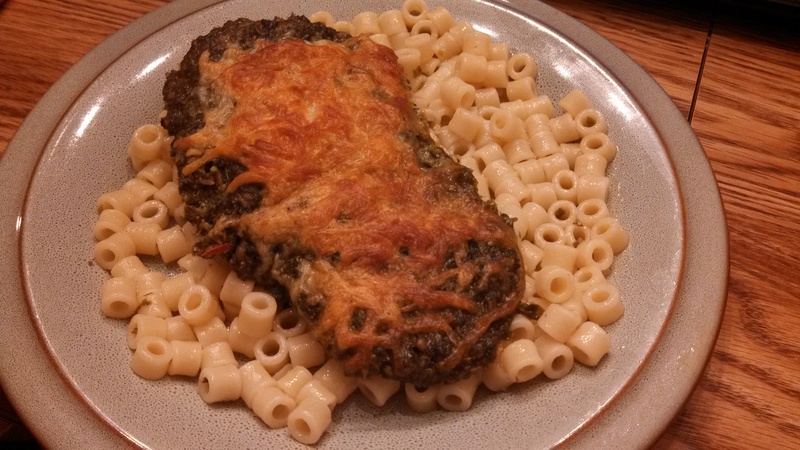 Tonight I served it with shells, but any type or pasta would work. Or, just enjoy it on its own with a veggie side of your choice. Pour sauce into 9 x 13 baking dish. Stir in 4 Tablespoons of the grated Parmesan cheese. .Add chicken; turn evenly to coat both sides with sauce. Cover with foil. Bake in the preheated oven for 30 minutes. Uncover. 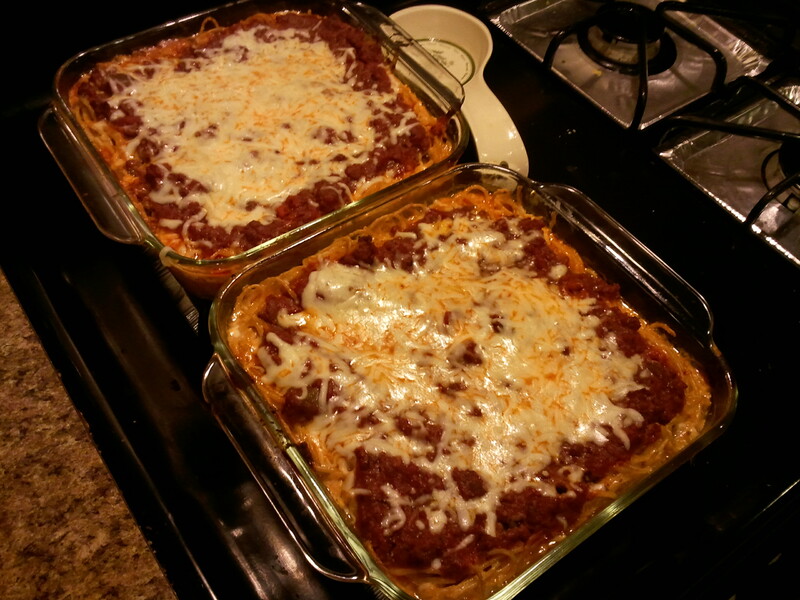 Top with remaining 2 Tablespoons grated Parmesan cheese and shredded mozzarella. Continue baking uncovered for 10-15 minutes, or until chicken is cooked through (internal temp of 180 F) and cheese is melted. 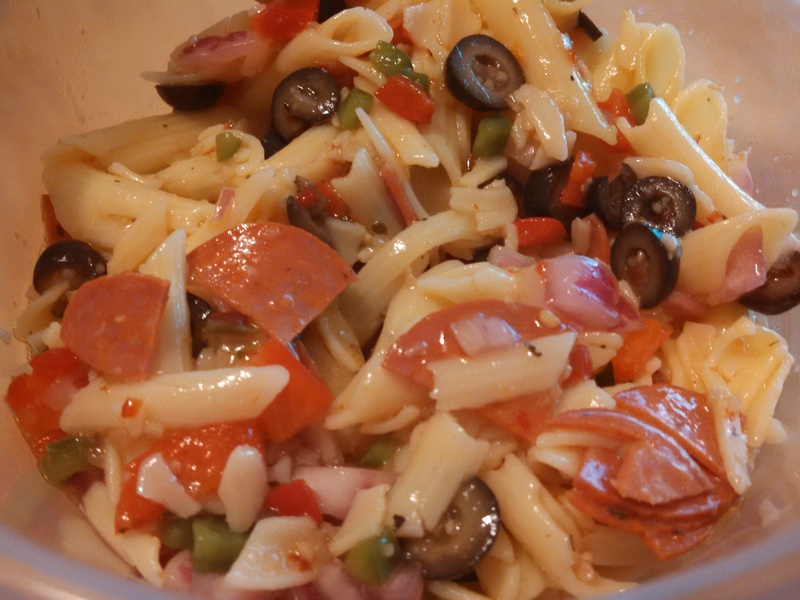 Serve over hot cooked pasta or with a veggie of your choice. After Katie was born, my mom came and cooked for us and gave me some easy recipes. 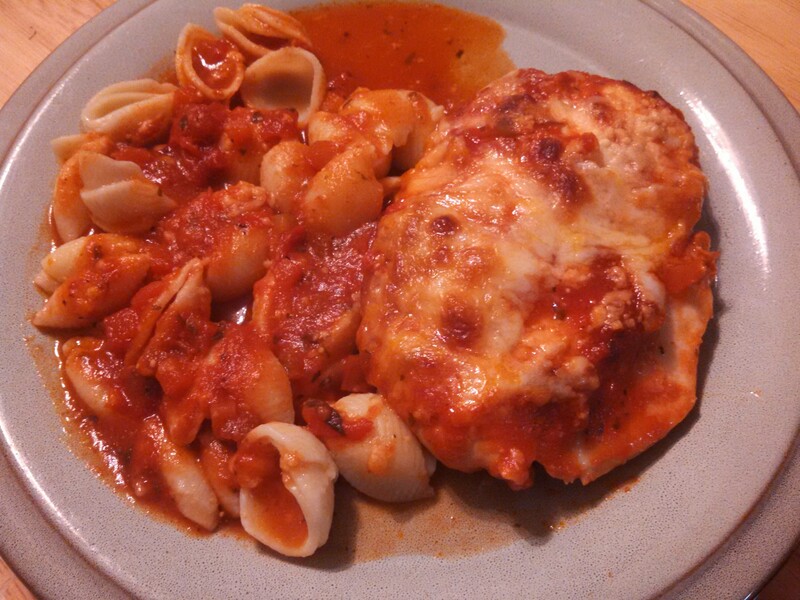 One of the recipes was an Easy Parmesan Chicken; place chicken in a baking dish, cover with tomato sauce, cover with foil, bake, sprinkle with mozzarella and Parmesan cheeses, bake again until the cheese melts. I had pesto in the refrigerator to use, so I followed the same instructions as my mom’s recipe, just using pesto instead of tomato sauce. It turned out really good, both my kids even liked it! I served it over pasta. Spray a 9 x 13 baking dish with non-stick spray. 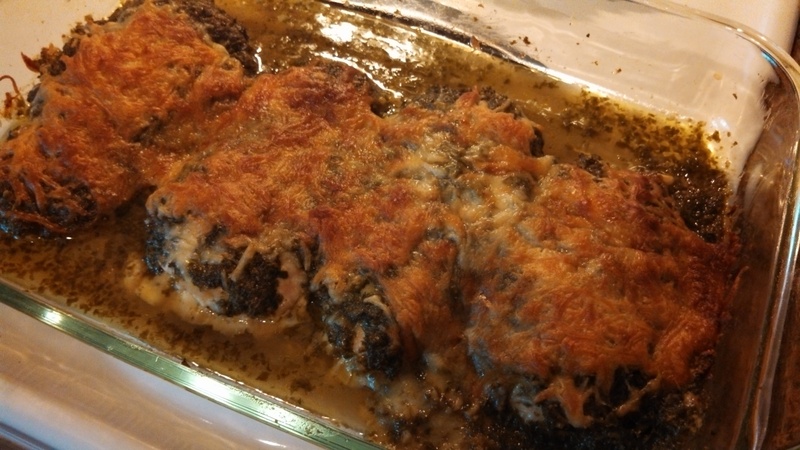 Place chicken breasts in baking dish. Spread pesto over all the chicken breasts. Cover the baking dish with foil Bake in the preheated oven for 30 minutes. Carefully remove foil. Top the chicken breasts with the shredded mozzarella cheese. Bake for 5-10 minutes, or until cheese it melted and chicken is cooked through. Serve over cooked pasta or rice. I poured the oil and pesto from the bottom of the pan over the pasta first, then served it with the chicken. My mom makes this occasionally when we visit, and while I’ve always enjoyed it, I’ve never actually made it. I finally got around to asking my mom for the recipe, and while they are in town visiting, we made it for dinner tonight. Since we had 5 adults and 2 kids to feed, we doubled the recipe and made it in 2 8×8 baking dishes instead of a 10″ round baking dish. 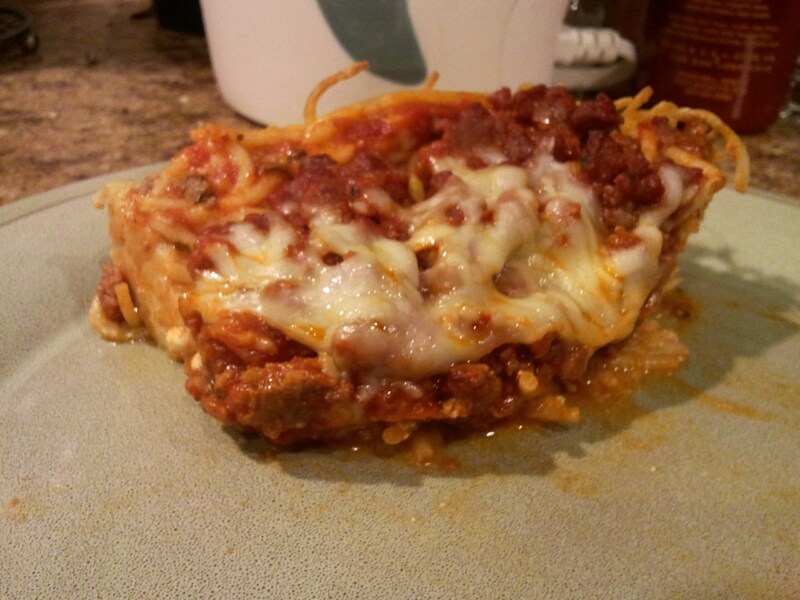 So, while one of my pictures will show it in 2 8×8 dishes, I will give the directions for 1 Spaghetti pie in a 10″ round baking dish. Cook spaghetti according to package directions, drain. Stir in the butter, eggs, and Parmesan cheese. Spray a 10″ round baking dish and press spaghetti mixture into the dish along the bottom and sides, forming it like a crust. Meanwhile, brown ground beef, drain. Add spaghetti sauce and simmer. Spread the cottage cheese over the spaghetti crust. Top with beef mixture. Bake uncovered for 30 minutes. Sprinkle with mozzarella cheese and bake 5 minutes longer, or until cheese melts.